Due to its arid climate, the state of Colorado gets most of its water from underground. Because of this, there have been issues regarding groundwater engineering practices. As many as 65,000 people were affected when high levels of PFCs were found in the Widefield Aquifer. 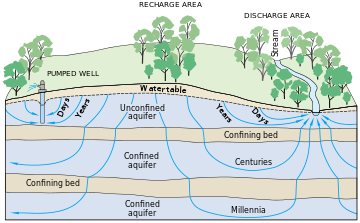 Groundwater use in Colorado dates back to before the 20th century. Nineteen of Colorado’s 63 counties depend mostly on groundwater for supplies and domestic uses. The Colorado Geological Survey has three significant reports on groundwater in the Denver Basin. The first report Geology of Upper Cretaceous, Paleocene and Eocene Strata in the Southwestern Denver Basin, The second report Bedrock Geology, Structure, and Isopach Maps of the Upper Cretaceous to Paleogene Strata between Greeley and Colorado Springs, The third publication Cross Sections of the Freshwater Bearing Strata of the Denver Basin between Greeley and Colorado Springs. In the United States, 51% of the drinking water comes from groundwater supplies. Around 99% of the rural population depends on groundwater. In addition, 64% of the total groundwater of the country is used for irrigation, and some of it is used for industrial processes and recharge for lakes and rivers. In 2010, 22 percent of freshwater used in USA came from groundwater and the other 78 percent came from surface water. Groundwater is important for some states that don't have access to fresh water. most of the fresh groundwater 65 percent is used for irrigation and the 21 percent is used for public purposes drinking mostly.